Alakajam! - an NPO | Alakajam! Over the last month or so, we have been busy working "behind the scenes", submitting the appropriate applications to make Alakajam an NPO: a non-profit organisation. I wanted to try to explain why this matters to you all. Initially, Alakajam was @wan's one-man project to set up a new site for running jams and creating a gamedev community. It was set up to be open source so that anyone can contribute, with a modern design and architecture. Another goal from the get-go was to make the site in such a way that makes it easy for different people to run a jam, to help moderate and even fix the website when needed. Crucially, we wanted the community to maintain and run the site, with no single keymaster and single point of failure. And this is where the NPO comes in. Alakajam is now an actual organisation, run by an elected board with transparent processes, finances and activities. Anyone who is interested can help out and contribute in various ways. After a year, there will be a board meeting and an election, where anyone can nominate themselves for a role. The sole reason for filing all this paperwork is that so Alakajam can be a community-owned site which can survive even if its founder decide to completely remove themselves from the process. Hopefully Alakajam will continue on for many years and jams to come - as long as its community want it to run! 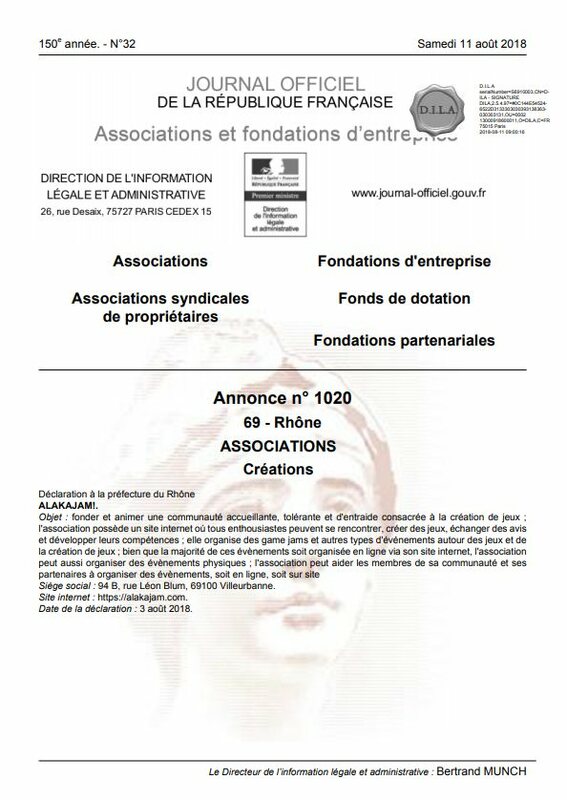 Registered in France on 11 August 2018, as an "association loi 1901"
Sounds great guys, I hope everything goes as planned! Love the site and what it stands for, these jams are great fun.